“Good Grief” by Lotty Lolly Weston, Wilson Winston. Lolly Winston. The name sounds so simple, and I have YET to say it correctly. It’s like when you forget how to pronounce “of”. Your heart says but it’s so easy and your brain says you’re just dumb. Mostly, I read this book just to see if Ms. Winston could pull it off. Good Grief is about Sophie Stanton. Her loneliness, and dreams, and thoughts, and unquenchable appetite for Oreos and praline and cream ice cream. She loses her husband to cancer, and we follow her as she goes through the different stages of grief. It’s personal, this book. Grief is personal. You don’t share how you really feel. You don’t want to bring down the house or have a blubbery melt-down in public. That’s what makes this book special. No one talks about grief. 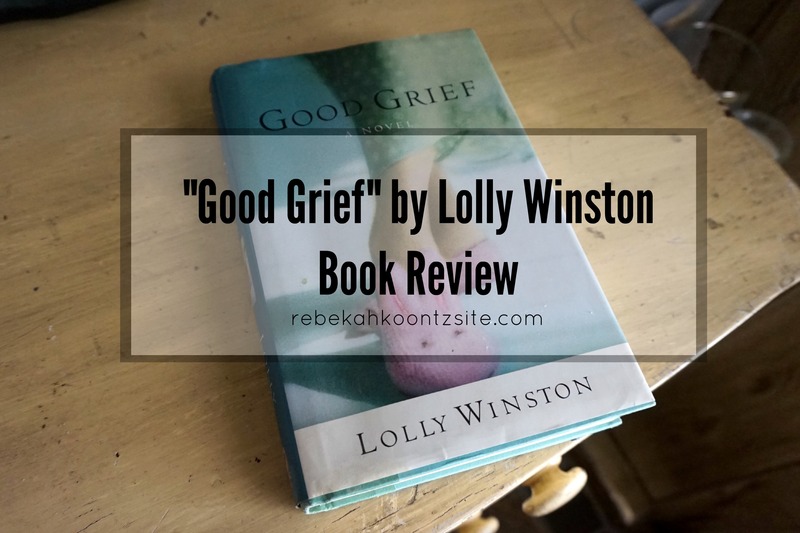 Lolly Winston expertly interweaved grief with Sophie. Sometimes grief is something a person becomes, a griever and nothing more. One dimensional. We feel sorry for them, want to console them, but mostly we want to leave the dreary, uncomfortable room to a place where we can breathe and start thinking about what toppings to get on our pizza at lunch. How can I be a widow? Widows wear horn-rimmed glasses and cardigan sweaters that smell like mothballs and have crepe-paper skin and names like Gladys or Midge and meet with their other widow friends once a week to play pinochle. . .
As a reader, you want Sophie to beat grief. She doesn’t know what that looks like, and neither do you, but it’s a united longing as you two push on to reach this goal. Sophie becomes a friend and a big sister. You care about her. Even when she does the craziest things, stupid or dangerous, you don’t make excuses for her, it’s not sympathy you feel toward her grief, you just understand. This is a great book. It’s made me see things a different way, perhaps even feel things differently now. The amount of bare truth and emotion in these pages make me wonder if Lolly Winston went through a similar loss. I may google this later. Obviously, Lolly Winston is a fantastic writer. She uses phrases like the house creaks and sighs or acne covered gourd. Phrases that I’ve never heard before but are used with an uncanny skill of combining two vastly distinct things and creating the perfect image in your mind’s eye. I’ll also add that this book touches on topics of teen cutting and self harm, however in a respectful and loving tone. I wasn’t expecting this, but I liked it. Lolly Winston does have a way of describing a simple accidental razor cut that makes your skin crawl, though. I was squeezing my index finger as if I were the one with bright red blood leaking out of a cut. I happily give this book a five out of five stars. Next month, I’ll be reading I Do Not Come To You By Chance by Abaobi Nwaubani. Jacob from That’s So Jacob has requested and suggested this book, and since I’m obviously a pushover to my first ever Blog Book Club request (thanks Jacob! ), I’ve agreed. It’s definitely not something I would’ve chosen by my own devices, so this should be interesting! I’ll be ordering it from the library once this post goes up. If you want to join the Blog Book Club, simply read along and Tweet/Instagram your thoughts, questions, criticisms, etc using the hashtag #BekahsBooks. At the end of every month, I’ll put together a main post conjoining my thoughts with yours. It’s great publicity for your site as I’ll link to you as well! Thanks! Did you link it?